How do we now whether energy drinks really boost energy, cell phones cause cancer, or Super Bugs are going to render antibiotics ineffective? 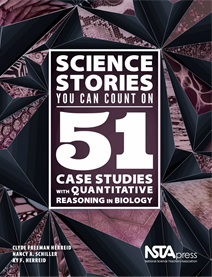 Science Stories You Can Count On weaves real-life questions like these into 51 case studies. The case studies are designed to engage students in 12 areas of general biology, from the scientific methods to microbiology to plant forms and functions. But that’s not all: The cases also promote data literacy by making graphical analysis and statistical and logical reasoning important parts of each store. Educators can update college teaching methods to work with new standards and new times with this idea-filled book from renowned science educator Robert Yager. The latest volume from the Exemplary Science series offers 16 examples of methods and frameworks that build on what college students learned in high school and encourage them to take an active role in their own learning. This handy Reader’s Guide unpacks the three key dimensions of A Framework for K—12 Science Education – scientific and engineering practices, crosscutting concepts, and core ideas in each specific discipline – allowing teachers, administrators, curriculum developers, university professors, and others to more easily grasp how the Next Generation Science Standards differs from the old standards. This book provides examples and inspiration to spark students’ interests in careers in science, technology, engineering, and mathematics. Some chapters showcase career-awareness. Authors Clyde Freeman Herreid, Nancy Schiller, and Ky Herreid have wisely surmised that stories put “flesh and bones” on scientific methods and provide an inside look at scientists in action. 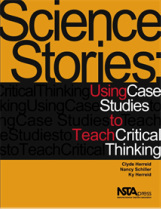 Better still, the stories or case studies lay the groundwork for understanding science and developing critical-thinking skills. These freshly drawn case studies—organized into categories of history, experimental design, unusual claims, science and society, the media, and ethics—are intended for use in college-level methods courses.